If you’re outside in cold weather, your feet are bound to get cold. So, follow these tips to keep those toes toasty and warm. It can make a big difference for cold or warm feet based on the environment you’re in, what activity you’re doing and, of course, what you’re wearing for boots. The sleet, ice and then snow were accumulating rapidly in downtown Manhattan, and there were a couple inches of slippery slush. The people on the packed street had a variety of ridiculous footwear, including one woman in stockings and stiletto heels. But my feet stayed warm and dry in my L.L. Bean Maine Hunting shoes. I wasn’t the only one in boots, but I was shocked at how many folks I saw in leather loafers, dress shoes and inappropriate footwear for the weather. In January of this year, I was helping cook lunch for a bunch of Boy Scouts and volunteers outside in Central Oregon. It was windy and the temperature hovered at 16 degrees. We stood on ice for several hours while we manned the Dutch ovens, cooking a rich stew. Despite excellent boots and socks, my toes still got cold and uncomfortable. I should have followed my own advice for a different combo of boot and sock. On another occasion, I had been snowshoeing for about an hour in moderate winter weather, and had steadily removed layers of clothing until I was down to a long-sleeved thermal top. Despite the cold – about 10-15 degrees – I generated a lot of heat and had to slow down to keep from breaking a sweat. My feet were not cold at all. I hike in many different environments, from deep snow to desert. My black lab, Naga, and I walk at least a mile every night in all sorts of temperatures and weather. This gives me the chance to test various footwear and socks. My standard procedure is to wear a typical 100% wool sock and boot on one foot, and try out the new boot, new sock, inner sole etc. on the other. This works out really well. I’m sure that looks odd to the person seeing the tracks because of the different tread patterns. A guy walking a dog with boots of different styles and colors might look a little peculiar, so I generally do this kind of testing after dark! INSULATED BOOTS: Start out with waterproof, insulated boots and your feet should stay warm, right? Well, it depends. First, your winter boot needs to be the right size. A common problem is that people buy hiking/hunting boots to fit with one pair of socks. Then, when they put in a pair of inner soles and heavy, insulated socks, the boots are too tight, and it affects the circulation in your toes. That can make your feet get cold. In my experience, boots need to fit snugly on the heel and ankle, and not be too tight across the arch. There should be ample room to wiggle your toes. Before investing in some boots, consider how much room might be needed for any additional layers. Get an expert to help fit your boots, and mention that you will want to wear thick socks and inner soles. 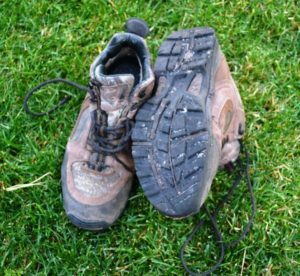 FELT INNER SOLES: Several years ago, I tried a pair of alpaca felt inner soles in my hunting boots. The quandary of elk hunting in the high desert is that you may stand in one spot for several hours in the frosty morning. Then, it might warm up and you might hike the rest of the day. 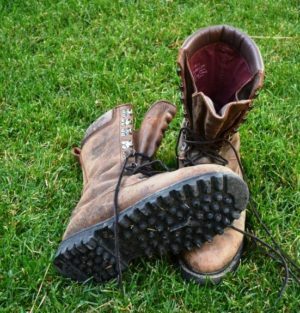 If you wear heavy, insulated boots in the morning, you’ll regret the extra weight and bulk in the afternoon. This is where felt inner soles may be the best choice. Since most of the cold comes from the ground, the inner soles insulate against that. When it’s time to hike, you remove the felt. The inner soles allow me to wear a comfortable, lightweight boot in much colder temperatures. This, in turn, let me hike further and faster with less fatigue. THE BEST SOCKS: Your socks may be the single most important factor in keeping your feet warm. Invest wisely, and don’t buy a bundle of cheap cotton socks and think they can keep your feet warm. Cotton is hydrophilic, meaning it is no good at wicking wetness away from the skin, and the material can become damp just by being exposed to humidity. Once wet, cotton feels cold and can lose up to 90 percent of its insulating properties. Wet cotton can wick heat from your body 25 times faster than when it’s dry. A basic cotton sock, according to the Heat Holders website, has a rating of TOG 0.33. This compares to an ordinary thermal sock rating of TOG 0.89. Smartwool hunting socks have a rating of TOG 1.23. These Dachstein wool socks are my standard for winter wear. Heat Holders Socks claim a TOG rating of 2.34. We’ll see. I’ve been testing a pair, and I’ll let you know soon. But for the moment, I’m sticking with 100 percent wool. 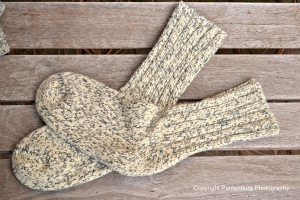 Wool absorbs moisture, but stays warmer than many other fabrics. Wool is also inherently flame retardant. I wear wool socks year round, and find they are actually cooler than some choices because they breathe so well. CHANGE YOUR SOCKS: Your feet sweat. Even if your feet don’t get wet, your socks will inevitably get damp, especially if you’re wearing waterproof boots. At a winter camp out, I wore the same heavy Dachstein Wool Socks all day. They were keeping me warm, but by the end of the day, they were noticeably damp. I switched to a dry pair, and the improvement in warmth was immediately noticeable. I always change to dry wool socks before climbing into my sleeping bag at night, and I never get cold feet while sleeping. BREAD SACKS: My buddy Jim Prestwood taught me this trick. Jim is a 15-year Search and Rescue veteran, former scoutmaster, and winter survival trainer. This technique will also work well if you have to wade a creek or river, and need to keep your feet as dry as possible. And if you get caught out in the rain with porous shoes, the plastic bags can keep your feet dry, even if you shoes get soaked. Cold feet can make you miserable outdoors, and in extreme conditions, be very dangerous. It’s a lot easier to prevent this from happening, than it is to remedy it later. It’s a fundamental lesson in emergency preparedness. Take a few common sense precautions, and you’ll keep those toes toasty.